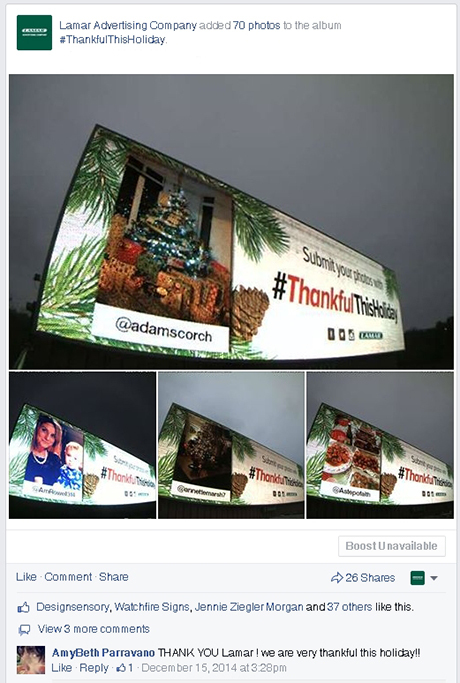 Using the flexible technological capabilities of its digital out-of-home network for the #ThankfulThisHoliday campaign, Lamar Advertising Company successfully demonstrated how out-of-home generates buzz on social media and drives interaction with consumers. Lamar Advertising Company is one of the largest outdoor advertising companies in North America. In addition to its more traditional out-of-home inventory, Lamar offers advertisers the largest network of digital billboards in the U.S. with over 2,000 displays. Lamar launched the #ThankfulThisHoliday campaign to drive consumer interaction in a fun, creative way during the holidays, while showcasing the flexible capabilities of their digital network. 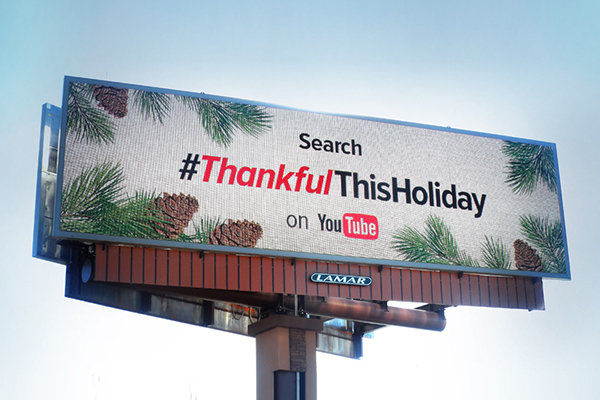 Throughout the month of December, Lamar gave people around the world the opportunity to share holiday cheer and express gratitude on digital billboards nationwide. They asked consumers to post photos of someone or something they were thankful for on Facebook, Twitter and Instagram with the hashtag #ThankfulThisHoliday. Using the technological capabilities of its digital network, Lamar then displayed the user-generated photos shared through social media on its digital billboards. Lamar announced the #ThankfulThisHoliday campaign with a short video, which was posted on YouTube, Facebook, Twitter and Google+ the week of Thanksgiving. They also ran teaser creative on digital billboards to drive traffic to the campaign video on YouTube from November 25 - 30. 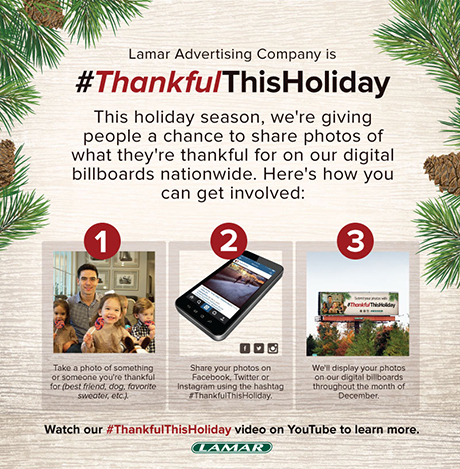 In addition to promoting #ThankfulThisHoliday on social media and digital billboards, Lamar distributed a press release to technology and media writers. The campaign generated positive press coverage in several media/marketing publications, resulting in 2,092,005 total impressions. They also featured a photo of the #ThankfulThisHoliday creative on their homepage, which linked to a webpage with the campaign video and details. Using the technological capabilities of its digital out-of-home network, Lamar displayed user-generated photos shared on Facebook, Twitter and Instagram on more than 750 digital billboards from December 1-31. 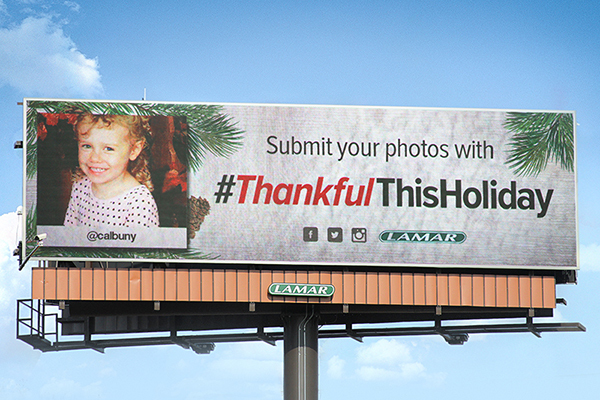 Throughout the campaign, Lamar displayed 311 user-generated photos tagged with #ThankfulThisHoliday on more than 750 digital billboards across the U.S. and Puerto Rico. Keyhole, a real-time social media tracking tool, was used to monitor the usage of the #ThankfulThisHoliday hashtag across Facebook, Instagram and Twitter. #ThankfulThisHoliday also had worldwide reach. The hashtag was used in over 30 countries during the campaign. Domestically, it was used in 47 states (with the exception of North Dakota, New Hampshire and Vermont).